The Executive Protector Flashlight by Brite Strike is a personal defense flashlight designed to emit a bright light to deter attackers. It features many of the same elements as law enforcement flashlights but its slim design is practical for anyone to carry and use. The Executive Protector Flashlight gives you peace of mind and a real line of defense. The Executive Protector Flashlight is designed for both men and women to provide a added security in a variety of situations. It is ideal for joggers, dog walkers, travelers, college students, campers, and senior citizens. The Executive Protector Flashlight is easy to operate, easy to carry, and - most importantly - effective at deterring attackers. The Executive Protector Flashlight emits 120 lumens on high and strobe. When shined in an attacker's eyes, this ultra bright light momentarily blinds the attacker to give you an opportunity to escape. The front crenelated striking crown can be used as a weapon if attacked. The three raised edges, when applied with force, can cause an attacker to release their grip. 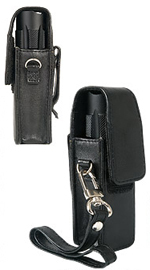 The button is located on the back of the Executive Protector Flashlight where it can be easily operated with your thumb. With the push of the button, you can turn on the light to low, then to high and strobe. The Executive Protector Flashlight is designed for simple, one-hand operation that can be achieved even in high stress circumstances. The flashlight can run for hours on low for everyday use a night. It runs on AA alkaline batteries. In addition to being a personal safety light, the Executive Protector Flashlight is a must-have on road trips and anytime you're driving at night. If a roadside emergency occurs, you'll have the Executive Protector Flashlight. 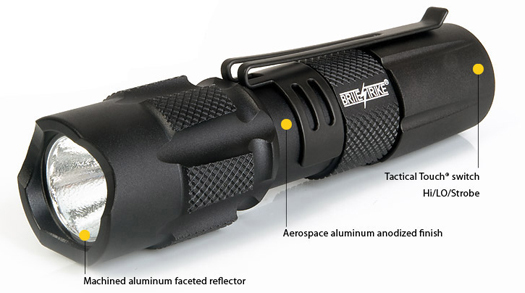 The aerospace aluminum body of the Executive Protector Flashlight is machine milled from a solid bar of aluminum and has a durable black anodized finish. Its durable construction is borrowed from the high performance tactical flashlights built by Brite Strike for law enforcement agencies. To stay safe, be aware of your surroundings and always carry an Executive Protector Flashlight. It makes a great gift for loved ones.